Boxing is the process of copying a value-typed object to a new instance of a reference-typed object. Boxing operations are classified as implicit conversions, in that you are converting between types in a way that is guaranteed to succeed and does not require a cast operator. Below are some examples of boxing operations. Recall that your C# source code is compiled to a platform-neutral intermediate language called Common Intermediate Language. You can view the IL for your application, after building the code, using the IL Disassembler tool. 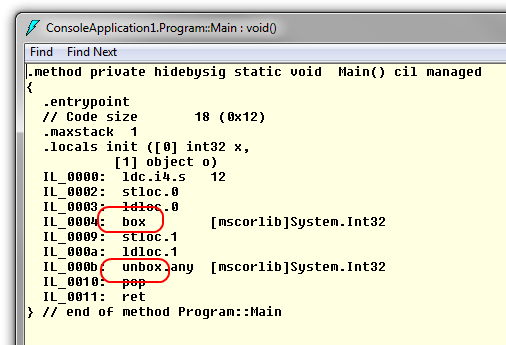 If you look at the IL generated for code that boxes or unboxes a value, you’ll see unique CIL instructions for boxing (box) and unboxing (unbox). Assume that you box an int value and then later unbox it. If you build this code and look at the IL, you’ll see the box and unbox instructions. When you pass a value-typed object to a function that accepts a parameter of type object, the value-typed object is boxed. That is, it is copied into a temporary reference-typed object, which is actually passed into the function. This boxing happens automatically. If we look at an object that represents a boxed value type, we’ll see that its reported type is the value type. However, if we try changing the object within the method, the original int that was passed in is unaffected. The boxed object is passed into the function using value type semantics. You can use the is operator to check to see whether an object can be unboxed to a particular type. The operator will return true if the object contains a boxed instance of the specified type. We know that we can do explicit casts when assigning from one type to another and the assignment will work if the value being assigned can be represented by the target type. But when casting as part of an unboxing operation, the target type must match the original type exactly. This cast, as part of the unboxing operation, is allowed at compile time, but throws an InvalidCastException at run-time. Boxing can happen automatically in C#, when you pass a value-typed variable to a method that accepts a System.Object (object). The Console.WriteLine method is a good example of this. It accepts a format string as its first parameter and then a series of object parameters, which represent objects to substitute into the format string. (Specifically, Console.WriteLine calls each object’s ToString method to get its string representation). We can pass in some reference-typed objects to Console.WriteLine. We can also pass value-typed variables into Console.WriteLine. The value types will be boxed–converted into reference types. An object will be created on the heap for each value-typed parameter and its value copied to the new object. If you’ve converted a value-typed object to a reference-typed object by boxing it, you can later unbox the object, converting it back to a value type. Now we have a copy of the integer in a new object on the heap. We can later convert this object back to a value type. This is known as unboxing. When we unbox, we need to explicitly cast the object to the value type. Because the integer derives from System.Object, we can convert it to an object implicitly, but when converting from an object to an int, we need an explicit cast. As with boxing, unboxing copies the value of the heap-based object. It does not delete the object on the heap or free its memory.